Can you believe this is the 7th year I’ve done Cookie-Thon? I guess it didn’t technically become a “Cookie-Thon” until about 5 years ago, but still… I was shooting for a number less insane than last year’s 3,454 cookies, but apparently less for me, was only by 10 cookies, bringing this year’s total to 3,444. Despite that, this year went a lot smoother thanks to a few things: taking Friday and Monday off to give me 4 full days, my friend Shawn lending me his mixer so I could run 4 bowls at the same time in equally powered machines, having my friends Aubrie and Ari helping on Saturday and my Maw Maw on Monday, cookie sheets as big as my oven that held 30-35 cookies, a giant spatula, and just overall better planning. I filled over 60 packages this year and 6 platters, mostly to the usual friends and family members that receive them every year. But the most fulfilling part of Cookie-Thon continues to be the ability to give cookies to strangers. The surprise of the pizza delivery guy, touched by the offer to come inside and have a warm cookie before he takes the road again. The comfort in the face of a neighbor I don’t really know, but who lost her daughter 2 months ago and is understandably struggling to feel Christmas joy. 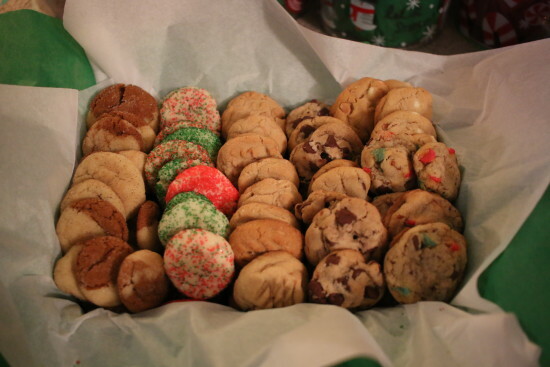 This is what Cookie-Thon is really about, this token of love, to whoever is willing to receive it. Spreading Christmas cheer is my absolute favorite thing to do and I implore all of you to find a way to spread some too. This year I had the opportunity to do something really worthwhile with the excess cookies and I am excited about being able to do it every year from here on out too. With about a bins worth of leftovers, I asked around for a good place to donate them, or for people who would like a small package themselves, and my old childhood friend Sasha suggested The Sharing Table. You remember, that humbling experience I had last year when I volunteered? She says they get well over 100 people for the Christmas dinner and now some of them will get to go home (or wherever they find shelter at night) with some of my cookies! I know it’s hardly enough to make their lives any better, but I hope it at least serves as a sweet treat in the name of Christmas that they would have otherwise not had. I’ve got this idea about making Cookie-Thon a sort of movement, where I release my recipes online and people all over participate in the same event, same weekend, and then we all set out to get them into the hands of people who don’t expect it – who need it most. Be that homeless people, cops, delivery people, someone who’s been down on their luck, etc… If we could create a movement to spread Christmas Cheer…. gah! it’d be an amazing thing to be a part of. Anybody interested in possibly being a part of this next year? For the most part I posted the progress of Cookie-Thon live on Instagram Stories and Snapchat this year, but I did manage to capture a few pictures with my good camera, too. If you’d like to see the process, click the image below! 2 Responses to "Cookie-Thon 2016"